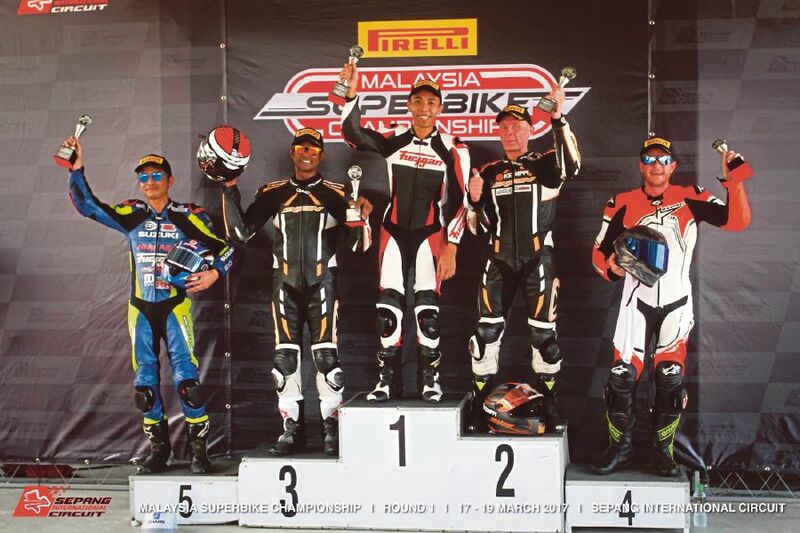 HomeNewsBMW rider Muhammad Farid Badrul Hisam ends the season as champion in the Malaysia Superbike Championship. November 27, 2017 Michael Le Pard News Comments Off on BMW rider Muhammad Farid Badrul Hisam ends the season as champion in the Malaysia Superbike Championship. Munich. The last races of the 2017 season for the international BMW Motorrad Motorsport racing family were held at the weekend. In Sepang (MAS), the Malaysia Superbike Championship (MSC) ended with the title win for BMW rider Muhammad Farid Badrul Hisam (MAS) in the Superbike class. He is the ninth champion from the BMW family this season. The 2017 SuperBike Series Brasil (BRSBK) concluded in São Paulo (BRA) with a double podium for BMW S 1000 RR rider Maximiliano Gerardo (URU). It was an action packed final race Sunday for the BMW riders in the Malaysia Superbike Championship (MSC) with two races each in the Superbike and the Superstock classes. BMW rider Muhammad Farid Badrul Hisam (MAS / HKM Times Bike Racing Team) tackled the final races at “Sepang International Circuit” (MAS) without any pressure – as he had celebrated an early title win in the Superbike class (MSC SBK) at the penultimate round. In Saturday’s qualifying, Badrul Hisam experienced bad luck with the weather. The session was stopped due to heavy rain before he could set a fast lap time on his BMW HP4 and as a result, he had to start Sunday’s first race from the back of the grid. He then made a fantastic recovery and was on course for a podium finish. After seven laps however, the race had to be red flagged after a competitor suffered a blown engine. In the results of the shortened first race, Badrul Hisam was classified fourth. In race two, the champion concluded the season with a third place on the podium. In the ten races held this year, Badrul Hisam claimed six wins, one second and one third place on the rostrum. In the Superstock class (MSC STK), Nasarudin Mat Yusop (MAS / BMW Motorrad Malaysia Team) was the highest placed BMW rider. In the first race, he crossed the line in seventh. The start of race two had to be delayed as a typical Sepang tropical rain shower hit the track in the afternoon. When the action resumed, conditions were treacherous with parts of the circuit still being very wet while other parts had already dried. Mat Yusop took no unnecessary risks and finished 16th. The 2017 season in the SuperBike Series Brasil (BRSBK) ended with a double podium for the BMW S 1000 RR. The final round was held at São Paulo (BRA). Maximiliano Gerardo from Urugay debuted on JC Racing Team’s RR, and it was a successful premiere. Gerardo finished both races in second place on the rostrum. Danilo Lewis (BRA / Tecfil Havoline Racing Team) was eighth in race one, but failed to finish the second race. Gerardo’s team-mate Davi Lara Costa (BRA) was classified tenth and ninth respectively.